While all of the national parks are truly gorgeous, in this list we highlight our favorites. And, after reading this list, we are sure a couple of these will end up at the top of your list too. Stretching from coast to coast, the parks on this list feature a wide variety of landforms and landscapes. Unique valleys, mountains, rivers, and trails make each park on this list a one of a kind experience. So what are you waiting for? Go visit one of these national parks! And, to help you with your travels, check out our list of the best travel sites and best travel accessories. Yosemite National Park encompasses almost 1200 square miles; it boasts everything from valleys and meadows to rugged mountain wilderness. Great hiking trails also abound here and provide excellent views of Yosemite’s giant sequoias. And, last but not least, North America’s highest waterfall (and one of the top waterfalls in the world), Yosemite Falls, is also located within the park. With two active volcanoes within the park limits, Hawaii Volcanoes National Park is located on the diverse Big Island. Intricate lava tubes run side by side with lush rainforests that are also perfect for bird-watching. While there, take the Kilauea Iki Trail and see vast volcanic craters, and watch as the glassy lava makes its way to the ocean. Utah’s first national park, Zion is also Utah’s most popular park. Gorgeous orangey-red rock walls abound and tower around the stunning Zion Canyon. A variety of hiking trails are available in the park and can be chosen by difficulty. Regardless though of which trail you take, all are going to provide stunning photo opportunities. So whether you are looking for a big-wall climb or a short hike through a portion of the canyon, Zion National Park is the place to be. Denali National Park is the home Mt. McKinley, North America’s tallest mountain. The park also encompasses more than six million acres of unspoiled wilderness. Big game, extreme temperatures, and fantastic scenery are all part of Denali’s appeal. The only national park in Maine, Acadia National Park is a gorgeous park renowned for some of the best hiking in the eastern United States. Mountains, stunning vistas, and water views make Acadia the perfect place to be inspired by nature. Acadia also boasts an Artist in Residence program. This program allows artists a chance to develop their art using the park’s landscape. Glacier National Park is located in Northern Montana, just south of the Canadian border. The park is going to feature stunning glimpses of Montana’s Rocky Mountains. The glacier-carved peaks and valleys traverse the park, and more than 700 miles of hiking trails make it a hikers paradise. Cycling and camping are also popular at the park. A network of roads will also allow car goers to access stunning and photogenic nature spots as well. With over a million acres of wetlands, Everglades National Park covers much of the southern tip of Florida. The Everglades is home to a number of animals, including alligators, manatees, panthers, and scores of birds. You can also find diverse flora like mangroves, sawgrass, and pines. All this combines to make the Everglades a very unique national park. Canyonland National Park in southeastern Utah features four distinct districts. Each of these districts offers a number of scenic outposts including canyons, mesas, buttes, and arches. These colorful and water sculpted layers of rock make for dramatic backdrops at every turn. A number of rivers and rapids in the park also make for great rafting, ensuring that there is plenty of adventure while in the park. A newer national park (established in 1980), Kenai Fjords National Park in southcentral Alaska covers over 600,000 acres of land. This national park is going to allow you to tour it by boat. These boat tours are going to allow an up-close look at the fjords and ever-changing landscape. An abundance of wildlife is also present at the park, with everything from mountain goats to black bears making their home in the park. While Mammoth Cave is the rightful star of the show with more than 400 miles of cave passages. There is also a lot to do above ground as well. Surface hikes, canoeing, cycling, camping, and horseback riding are all offered at the park’s 52,800 above ground acreage. Glacier Bay National Park consists of over 3 million acres. The park encompasses everything from mountains and glaciers to temperate rainforests and fjords. Humpback whales and puffins abound here, and the bay’s coast is a popular route with cruise ships and other boats. For stunning scenery and unique wildlife, Glacier Bay should not be passed over. For alpine wilderness at its finest, North Cascades National Park is the place to be. Situated in northern Washington State, the dense evergreen forests and mountains are a hikers paradise. More than 200 bird species call the park home, as well as bears, wolves, and other mammals. For a true a Pacific Northwest experience, North Cascades National Park is a great choice. Petrified Forest National Park is aptly named – the Rainbow Forest in the park’s south is full of colorful petrified wood. This isn’t all the park has to offer either. Paleontology exhibits, petroglyphs, and Hopi murals can also be found at the park. A number of lesser traveled backcountry hikes are also available. All this comes together to make the Petrified Forest a perfect place for those wanting a road less traveled. Hot Springs National Park is the place to go for healing thermal waters. You will be able to visit the historic Fordyce Bathhouse, stroll along the Grand Promenade, and bathe in the thermal pools. Outside of the water, you will be able to hike trails and view scenic mountain roads. All this will ensure that you can work up a sweat before your thermal bath. A park of extremes, Death Valley National Park is perhaps best known for its extreme temperatures. It is also the site of North America’s lowest point. There is more than just that at the park though. Death Valley Park offers towering peaks, salt mounds, colorful rocks, lush oases, and an abundance of wildlife. Arches National Park in Utah is a red rock wonderland. It has more than 2000 natural sandstone arches, massive pinnacles, fins, and giant balanced rocks. Famous arches include the Delicate Arch in the east and the Landscape Arch in the north. For genuinely awe-inspiring formations, scenic trails, and amazing sunsets, this is the park to visit. Sequoia National Park is located in California’s southern Sierra Nevada mountain. The park is home to the home of the world’s largest trees. The park also features caves, a granite dome with sweeping park views, the Tunnel Tree, deep canyons, and plenty of foothills and mountains. To truly appreciate the size of Mother Nature, Sequoia National Park must be visited and explored. Rocky Mountain National Park is a little smaller in size coming in at 415 square miles. What it lacks in size though, it makes up in the views department. The park spans the Continental Divide and contains spectacular mountains, forests, and alpine tundras. Hiking trails abound here (more than 300 miles of trails), and are the perfect place to take in the majestic mountain views. With rich fossil beds, the mixed-grass prairie of Badlands National Park in South Dakota is a sprawling park worth visiting. Layered rock formations, canyons, spires, and grasslands abound here. Visitors are also likely to see bison, bighorn sheep, and prairie dogs on their visit. The Badlands Loop Road is also a great way to see the park by car and winds past a number of scenic lookouts. Home to a dormant volcano, Haleakala National Park on the island of Maui in Hawaii is a remote and breathtaking national park. The park has both volcanic landscapes and sub-tropical rainforests that are equally stunning. For an unforgettable hike and breathtaking scenery, Haleakala is a must see. Spanning the states of Wyoming, Montana, and Idaho, Yellowstone National Park is the nation’s oldest national park. Buffalo and bears abound here, making it easy to see wildlife up close. Old Faithful, perhaps the most famous geyser, is also located within Yellowstone. The largest hot spring in the United States is also within park limits. Olympic National Park is one of the most visited national parks on this list. It is located in Washington state and is the only temperate rain forest in the contiguous United States. Active tide pools, lush green forests, and the stunning Olympic Mountain range make for a diverse park. All of this also ensures that visitors have plenty to see and do when visiting Olympic National Park. The beautiful, jagged peaks of the Teton Range are the centerpiece of Grand Teton National Park. These peaks provide both stunning views and excellent skiing. Jackson Hole, Wyoming, a top-rated destination is also just steps away, making Grand Teton a great year-round destination. Spanning Tennessee and North Carolina, the Great Smoky Mountains National Park is the most visited park in the United States. Gatlinburg, TN, and Cherokee, NC both provide access points to the park. Within the park, you will truly be able to experience nature in the wide open mountains and trails. After visiting, it is easy to see why so many people love the Great Smoky Mountains is the most. It’s one thing to see a photo of the Grand Canyon, but seeing the vast, awe-inspiring canyon in person is another matter entirely. While the second most visited national park in the country, the park’s many trails ensure that peace and solitude can be found. For the truly adventurous, the 9.3 miles Bright Angel trail showcases the canyon’s beauty. If you want a more relaxed, but still beautiful trail, the Rim Trail also provides excellent views of the canyon. If you can look through this list of the best national parks and not feel inspired to visit one of these awe-inspiring parks, you may need to check your pulse. With this list we wanted to do our best to include some fantastic parks from all over the country. This way, wherever you live in the US, you can find a park that is close enough to encourage you to make a trip to. Add a couple of these great parks to your bucket list, and then cross them off with a trip to visit them. 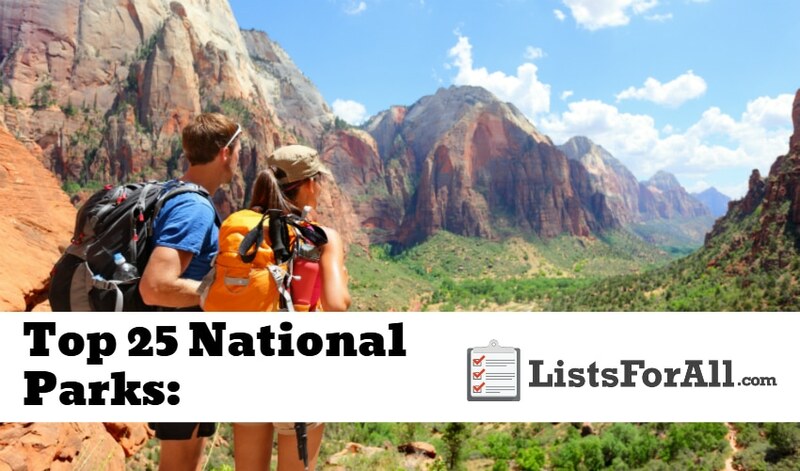 Have you been to one of the parks on this list? Let us know what you thought of the park in the comments below.